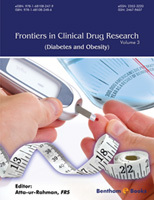 Frontiers in Clinical Drug Research – Diabetes and Obesity Volume 3 comprises five comprehensive chapters on novel approaches to combat diabetes and obesity. In Chapter 1, Zhang et al. review the research on Extendin-4, a short peptide derived from lizard saliva, which has been used to treat diabetes and obesity. Insulin-like growth factor and growth hormone are two biochemical agents that play a role in diabetes and obesity. In Chapter 2, Moira S. Lewitt reviews the role of these two hormones in the management of diabetes and obesity. Patients with long term diabetes suffer from heart problems and other organs are also affected. These problems have been attributed to physiological conditions brought about by the long term effects of insulin resistance on the body which result in hyperglycemic conditions and the presence of reactive oxygen species in mitochondria. In Chapter 3, Niels Juel Christensen presents a comprehensive review on insulin’s effects on capillary permeability in muscle endothelial cells and in podocytes in the kidney. In Chapter 4, Oliveira et al. present an interesting review on diabetes induced male infertility and pharmaceutical research being conducted to address it. The authors cover the physiology of male infertility, the epigenetics of diabetes induced changes to male gametes and the potential drug targets for treating this condition. In Chapter 5, Katarzyna Zorena discusses the role of adipocytokines in type 2 diabetes mellitus. The author points out that monitoring concentrations of adipocytokines in the blood can be beneficial for detecting insulin resistance which leads to diabetes. Understanding adipocytokines biochemistry could be the key to prevent the early onset of type 2 diabetes mellitus. I am very thankful to all the authors for their outstanding contributions. I would also like to appreciate the efforts of the dedicated team of Bentham Science Publishers, especially Dr. Faryal Sami (Assistant Manager Publications), Mr. Shehzad Naqvi (Senior Manager Publications) and Mr. Mahmood Alam (Director Publications).